Although the NYC subway system may be hemorrhaging money, unable to turn a profit despite annual fare increases, expanded services and a slew of other measures, there is one thing that it can gloat about. 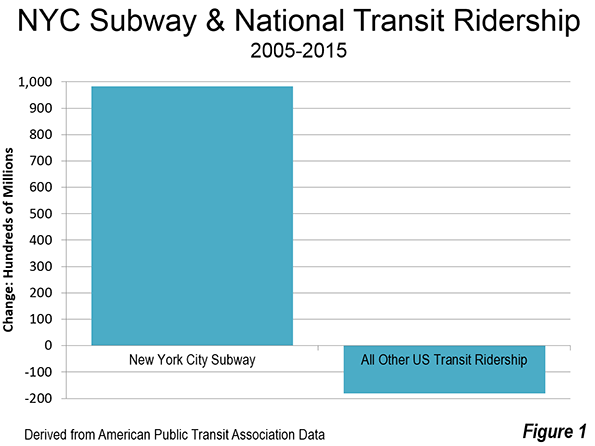 According to a just-released annual report from the American Public Transportation Association (h/t New Geography), the New York City subway accounts for ALL of the transit increase seen in the United States between 2005 and 2015. In the last decade, subway ridership has ballooned nearly a billion trips, while transit systems outside the New York City subway saw a loss of nearly 200 million riders over the same period. And if current figures are any indication of what’s to come, this trend will only strengthen. As 6sqft reported in April, NYC subway hit 1.7 billion annual trips, the highest since 1948 when ridership was at its peak. “The New York City subway accounts carries nearly 2.5 times the annual ridership of the other nine largest metro systems in the nation combined,” New Geography points out. It carries 11 times more riders that the Chicago “L” system, 10 times that of Washington’s Metro, and 50 times more than the Los Angeles system—though to be fair, L.A. has only in the last two decades started to build out its rail system, whereas the NYC subway is more than 100 years old. 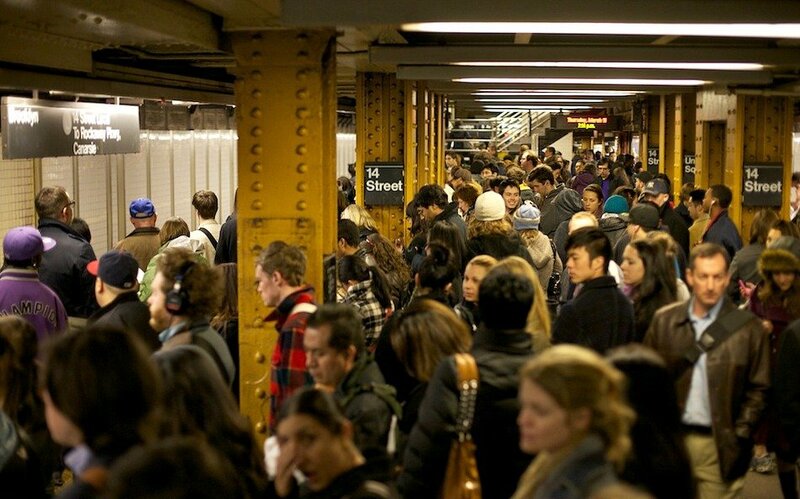 Moreover, the NYC subway also benefits from population density, 24/7 service and safer riding conditions (i.e. lower crime rates—largely what’s given it significant boosts since the more troubled 70s and 90s). 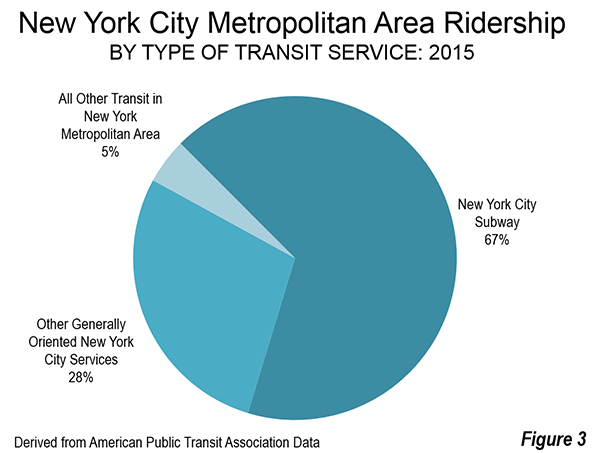 Unsurprisingly, the subway also dominates over other regional transit systems, including the PATH, LIRR and Metro North, at 67 percent. “Other” inner-city transit options (e.g. the bus) make up just 5 percent of the total. 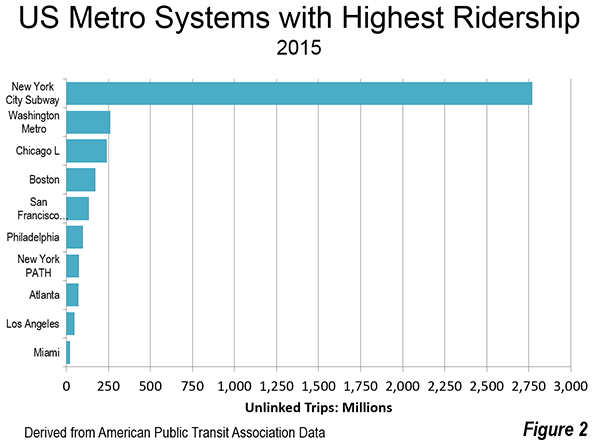 Adding to all of this, just last year, the American Public Transportation Association found that 2014 national transit ridership marked an unprecedented high for the United States. Meaning the success of our country’s transit can wholly be attributed to how “effective” NYC’s subway system is. Oh, the irony. How Long Should You Wait For the Subway Before Giving Up? The (L) kine appears to be their fastest growing line as we speak, and the service is good indeed. Most other lines have relatively decent service, however the (R) for Rotten, Rarely or Rancid is an exception, and can use a ton of improvements in service, perhaps a shorter route indeed.